"I wish to convey the beauty of Japanese Literature"
Panpan-san. I think it is cute the way Chinese people name their girls with repetition of the given name. I think it is very “Chinese” indeed. You think so! Thank you. Well, “A (family name) BB (given name)” is very common in China. I was born in 1990 and it was the year Asian Games was held in Beijing. I was named after the panda which was the official mascot of that game. Because of that, my nickname was “Panda” (laughter) during my younger days. I came from Jiangshan, which is a small city in the west of Zhejiang Province in China. Jiangshan City is adjacent to Anhui Province in the west and Fujian Province in the south. It has flourished as a town of trade and well-known for its scenic beauty. Jianglangshan (Mount Jianglang) is a famous tourist spot inscribed onto the World Heritage List. One of the most typical local dishes of our province is steamed rice wrapped in bamboo leaves and we call it "zongzi". There are sweet zongzi as well, but my mother usually makes zongzi with meat seasoned with soy sauce. The chopped pickles in the zongzi cut down the greasiness of the meat. Zhejiang is close to Shanghai, so overall most of the food tastes quite bland. But in my town, most people prefer rich and spicy food, including me. What is it about Japan that captured your interest? I like the Japanese anime, SLAM DUNK, since young. I like the story because it shows the boys’ passion for basketball, and the girls cheering them enthusiastically. It makes me feel “seisyun (youth)” (laughter). I got attracted to the sound of Japanese language from this anime. I began to think how good it would be if I could understand and sing the theme song in Japanese. That was the beginning of my fascination to learn Japanese. But I started learning for real only after I entered university. I understand that you are in the Doctoral Course in the Graduate School of Letters. Yes. It is actually my second time studying in Hiroshima University. When I first came here, I was a Master’s student in China. I came to Japan under the HUSA (Hiroshima University Study Abroad) Program. My seniors told me HU accepts many international students and that we can study at ease here. Then, I came to HU for one year as an exchange student from September 2013. I returned to my country after that and worked on my Master’s dissertation for one year. After obtaining my Master’s degree, I came back to Japan to study in the Graduate School of Letters again. That was September 2015. What was your first impression of HU? In one word, “Global”. The orientation for new students of the HUSA program was really impressive. Many staff from the International Exchange Group, as well as teachers in charge, joined the orientation. The person I remembered most was the teacher who was also the MC. She was really powerful and energetic. I was purely amazed of how international HU is. We, the East Asian people, are always thought to be shy and quiet. Not many of us are open-minded like the Westerners. At the orientation, I saw Japanese and foreigners sitting down together chatting and joking casually, and at the same time, expressing their standpoint directly. It was totally unexpected to me and I felt “cheated”, in the good sense, of course. Since then, my impression towards Japanese people is completely changed. I see. What about the impression of Japanese students you study together with? I think they are serious and well-disciplined. They are also very precise with details. What I mean is that they are very “delicate”, polite and humble. They always do their utmost to provide the best they can. These are the virtues I must learn from them. You really think highly of them! Frankly speaking, sometimes I do think “Why the fuss?” (laughter). But because I learned about Japanese society and their culture when I studied Japanese in China, I was not surprised or uncomfortable at all when I encountered such situation. I was calm and thought “Oh well, this is the ‘delicate’ part of Japanese people” (laughter). This reminded me of what I learned in my country. This is quite a different experience from my first orientation where I first met the open-minded globalized Japanese teachers. What are you studying on now? I have studied Japanese Modern and Contemporary Literature, but most of my focus today is on contemporary literature. I am focusing on the author, Shusaku Endo. It has been over 20 years since his death, but he indeed is an author of the contemporary age. Endo first released his critical essay in 1947 after World War Two ended. Since then, he devoted himself to writing for almost a half-century until he died in 1996. I first got to know about him from his works Silence and Deep River and personally, I like Deep River better. It is a story about five main characters of different generations and backgrounds, reminiscing over their lives as they travel to a faraway land. I made a presentation on this novel during a conference in the Society of Shusaku Endo in September, 2016. Please tell us more about your research. My research focuses mainly on female characters, so I chose to study two women, “Mitsuko” and “Keiko”, from this novel. I made a presentation on this and Japanese professors in the same field highly commended on my research on Keiko. Because, while most researchers tend to focus on some of the main five characters, I chose to focus on Keiko who is not outstanding and has hardly drawn attention of researchers before this. What made you so interested in this character? I guess it’s her “presence”. As I read further in this novel, I feel the representation of her as a reserved and plain woman growing bigger and bigger inside me. She is described as a “ryosai kenbo (wifely and motherly)” woman despite not having any children. She is a “comforting” character, always welcoming her husband who is tired from work with a warm smile. In view of the social situation of Japan at that time, she represents the ideal image of women of that era. I would love to tell you more about what I see in this plain woman and what attracted me to her, but it will be too technical, so… (I think I better stop here). So your research covers the character in depth. When reading a novel, people tend to focus on the dramatic story line. It is a way to enjoy the story and a good reading experience. But as a researcher, we have to observe something different, something beyond what normal readers will notice. There are many ways to do so. For me, I look into the author’s life experience or make comparison between his works, hoping to discover something new. Thank you for your detailed explanation. I understand that you have experience working on campus as a PA (Phoenix Assistant). Yes, I worked in the International Exchange Group office for one and a half years. I was a counter staff attending to international students. I was able to make full use of my language abilities, Chinese, English and Japanese, to help international students to solve their worries and problems. It is a fulfilling job. For example, they come to us with letters from the city hall and do not know what to do, or some asked about visa renewal procedures. It covers matters of everyday life, and I was able to make use of my own experience, which is my advantage as an international student, to help them. It is really a very rewarding job. I heard that you have an internship experience as well. Yes, that was during my HUSA year. I registered for “Globalization Support Internship” course for HUSA Program students. I worked together with other interns to plan and implement the Citizen Reporter Project in collaboration with the Higashihiroshima City Office. Also, with the cooperation from Kurahashi Junior High School, Nagato Ship Building Museum, “Enjoy Country Life Group” of Okimi town in Etajima, etc., we organized the “Kurahashi & Etajima International Exchange Tour” for HUSA students. 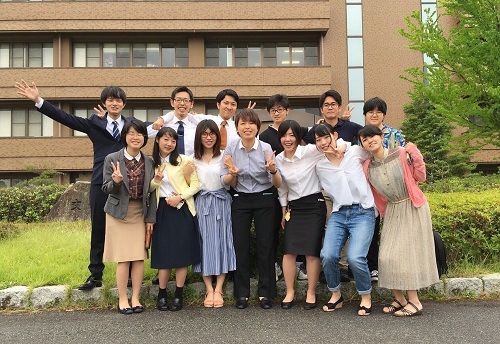 Through these internship experiences, I learned about making decisions and taking actions at every step of the project, as well as about working manners as a member of society and also the structures of Japanese society. I have seen the photo taken during your internship. You sure look cool in suit! At "Yumekirai" in Etajima with my fellow HUSA intern. The sunset is so beautiful. This photo was taken while taking a rest after we completed the project work. That was the first time in my life to buy the formal suit because of the internship. I made my name card at the university coop and practiced how to exchange cards with others. It is difficult to present and receive cards at the same time. I am still not sure of which comes first and after (laughter). Yes, I think it is difficult too (laughter). Another thing, in Japanese society, there is a custom called “oshaku (pouring drinks for each other)” when drinking together. I knew nothing about this custom during my early days in Japan. There was once when I was drinking with a superior, he was drinking and pouring his own sake (tejaku drinking), I didn’t realize a single thing until a Japanese student pointed out to me. Since then, I started to pour drinks for my drinking partners at situations like this. But I get nervous when doing so that I spill the drinks sometimes. You seem to be absorbing a lot from inside and outside your lab. By the way, as an international student with rich experience, what do you think is the most important element in international exchange? In Japanese, there is an idiom “i-shin-den-shin (heart-to-heart communication/ tacit understanding)”. It means to understand each other without words. In my understanding, “i-shin-den-shin” means to value others and cherish their feelings. When communicating between foreigners, language somehow becomes a kind of barrier. The barrier will be overcome if we try hard to understand what the other party is trying to convey beyond words. I think the effort to try to understand others is the most important essence when interacting in an international community. That is a wonderful interpretation! Thank you very much. Do you have any advice for younger students who are considering studying abroad? Studying abroad gives us the opportunity to discover a new you and we need a challenging spirit and courage to grab the chance. It will be a shame if we get intimidated by thinking “I doubt I can do this” and back down from the challenge. I would advise all students not to be afraid to grab whatever opportunity you can get from your study abroad life. This way, I am sure the day will come when you discover the new you, someone you have never realized you were or expected you could be, and that you are actually a fabulous person. This is my last question. What is your dream for your future? My dream is to become a teacher one day. And I would like to be able to convey to people of my country the charm of Japanese literature. For example, Japanese literature represented by the works of Yukio Mishima and Yasunari Kawabata, which expresses the desire for beauty, in other words, “mono no aware (the sadness or pathos of things)”. I think this kind of literature can be symbolized with the ephemeral beauty of sakura (cherry blossoms) blooming and falling in an instant. In addition, I also want others to know the value of another kind of literature concerning about the “eternal things”, like the works of Endo which explore the root of all religions. Also, I hope to be able to organize international literary exchange events for Chinese and Japanese people with the help from researchers I got acquainted with here in Hiroshima. I pray that your dreams will come true. Thank you very much for your time today. At the Nagato Ship Building Museum in Kure with my fellow HUSA students. We enjoyed the “Kurahashi & Etajima International Exchange Tour” planned and organized by us, the interns. At a theatre in Hokkaido with my music teacher from Zhejiang University of Technology (The university where I graduated with a bachelor’s degree). 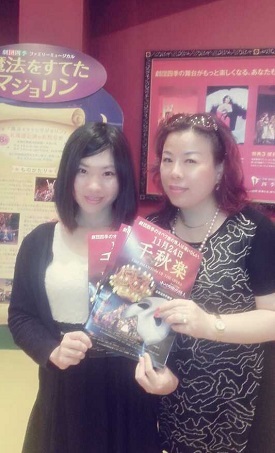 We watched our favorite musical, “The Phantom of the Opera”. At Kinkakuji Temple in Kyoto. I was there as a volunteer staff for the Japanese Language and Culture Special Program Winter Session.